Everard DIGBY Esquire (1414-1461) was Alex’s 17th Great Grandfather; in the Miner line. Since our Digby ancestors really were knights, their coat of arms belongs on each of their pages. Everard “Greenleaf” DIGBY was born 1415 in Stoke Dry, Rutland, England. His parents were Simon DIGBY and Joan BELER. 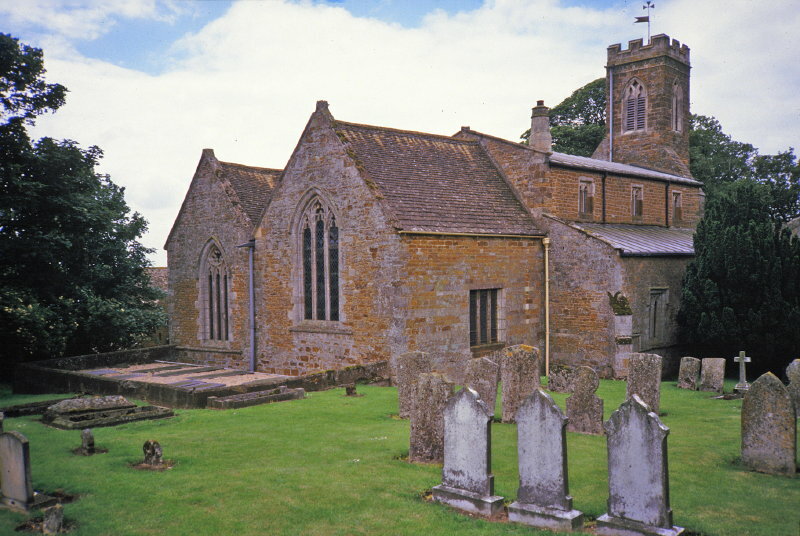 He married Agnes CLARKE on 1439 in Stoke Dry, Rutland, England. Everard died 29 Mar 1461 at the Battle of Towton, West Riding, Yorkshire, England. Dating at least from the Norman period, Stoke Dry Church was largely rebuilt during the 13th (west tower) and 15th centuries. Although small, the church has many interesting features – a carved Norman arch, a 15th century oak rood screen and tombs belonging to the Digby family who once lived in Stoke Dry. Of special note are the splendid medieval wall paintings which show the martyrdom of St. Edmund. Above the north porch is the priest’s room or parvise. Reached by a narrow staircase from the north aisle of the church, it is said to be where Everard Digby planned the failed Gunpowder Plot of 1605. There is little truth in this tale however. Although Sir Everard Digby was one of the plotters he did not live at Stoke Dry at that time. Stoke Dry, Rutland Feb 1509 in Tilton, Leicestershire, England. Everard Digby, in the reign of Edward IV, was killed, together with his three brothers, fighting for the house of Lancaster at the battle of Towton 29 March 1461. His seven sons fought for Henry VII at the battle of Bosworth Field 22 August 1485. Stok (xi cent. ); Stokes, Dristok, Drie Stok, Stokedreye (xiii cent.). Stoke Dry borders on Leicestershire, and though mainly in Wrandike Hundred, a small portion known as Holy Oaks Liberty extends into Stockerston parish in Gartree Hundred (co. Leic.). The parish covers an area of 992 acres of rich loam and is nearly all under pasture. The land rises from the Eye Brook, which forms the county and parish boundary on the west, to over 500 ft. above the Ordnance datum in the north of the parish at Stoke Great Wood. In 2007 it had a population of 39. With only 14 homes this is a quiet village with its mediaeval church dedicated to Saint Andrew. 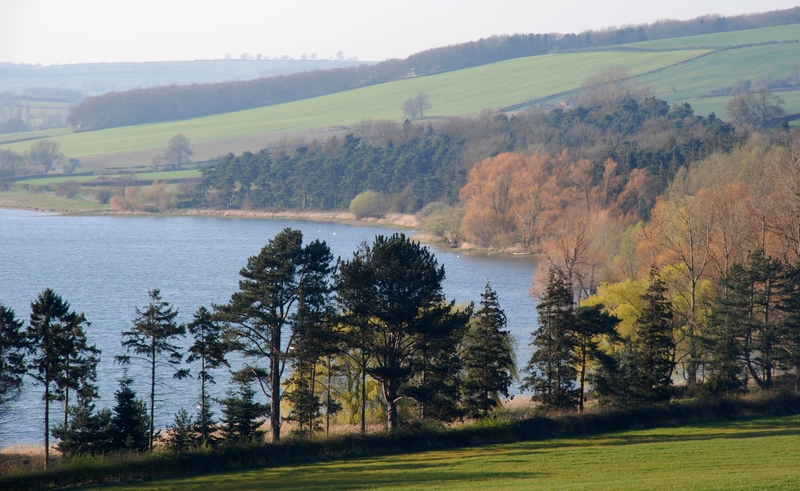 The small village lies on the west side of the road from Uppingham to Kettering, and is prettily situated on the western slope of a ridge with a fringe of trees on its south side. The church is on the east side of the village street, with the rectory to the south of it. On the opposite side of the road is the Grange, which probably belonged to the Knights Hospitallers. Stoke Dry was the ancient residence of the famous and ancient family of Digbys, but nothing now exists of the house they formerly occupied. There remained until about 1871, behind some farm buildings south-east of the church, what appears to have been part of the stabling, or other outbuildings, of the Digby manor house. This consisted of an oblong stone building measuring internally about 48 ft. 6 in. by 16 ft. 6 in., and apparently of late 16th or early 17th century date. It had been long used as a farm store, and the internal partitions and dividing walls removed. The tenants of Stoke Dry formerly had common rights in Beaumont Chase, which lies to the north-west of the parish, and they received compensation in lieu of them under the Inclosure Act for Liddington in 1798. STOKE (DRY) was entered in the Domesday Survey as pertaining, with Snelson and Caldecote, to the Bishop of Lincoln’s 2 hides in Liddington (q.v.). The bishops of Lincoln had as tenants at Stoke Dry in the 13th century a branch of the family of Neville. Gilbert de Neville, who held five knights’ fees of the Bishop of Lincoln in 1156 and 1166, was holding lands in Rutland in 1158. He died before 1169, leaving a son Geoffrey who died in 1193 and was succeeded by his son Henry. At the death of Henry in 1227 without issue, his property went to his sister Isabel, wife of Robert Fitz Meldred, and so to the Nevilles of Raby. (Hasculf de Neville with Christine his wife, who held lands in Rutland in 1250, probably belonged to a cadet branch of these Nevilles. Hasculf de Neville had four sons: Robert, Thomas, Peter and Stephen. Robert sided with the Baronial party, and after the battle of Evesham in 1265 his lands in Stoke Dry were seized but restored to him in the same year.He settled his lands on his son Thomas and his heirs, with remainder to his brother Thomas. 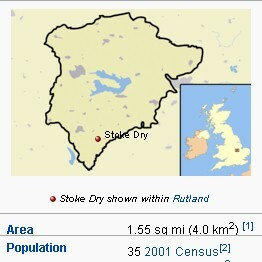 His son Thomas was dealing with lands in Stoke Dry in 1297 and died in 1303. One part of his property in Stoke Dry went to Theobald, son of Peter de Neville (d. c. 1276), brother of Thomas’s father Robert, and the other to John son of Stephen de Neville, another brother of Robert. The Bishop of Lincoln claimed the land as an escheat on account of the outlawry of Peter, but Peter, before his outlawry in 1272, had enfeoffed his son Theobald, who was in the king’s service in Scotland. The Nevilles seem to have maintained their right to the property and, probably for assurance of title, conveyed the two estates in 1304 to Walter de Langton, Bishop of Coventry and Lichfield. In 1313 John de Neville granted the manor of Stoke Dry to Roger de Morwode and his wife Joan (probably John’s daughter) and their issue, with remainder to his own heirs. 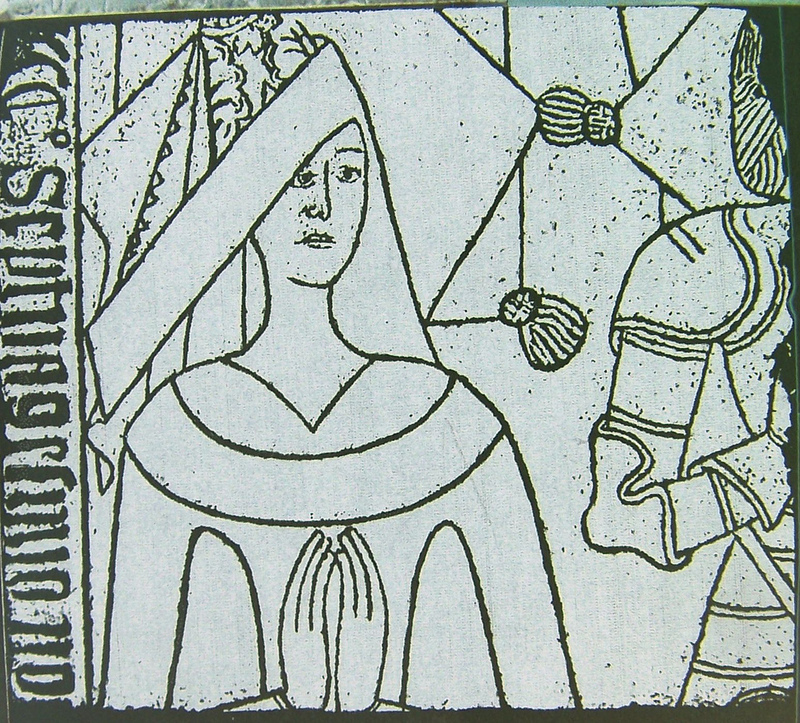 John de Neville of Stoke appears, however, in a commission of oyer and terminer in 1316. The Bishop of Lincoln and Roger de Morwode were in 1316 assessed to an Aid for Liddington, Stoke Dry, Snelson and Caldecote. Roger de Morwode was succeeded by his son another Roger, and in 1368 William, son of the latter Roger, recovered seisin against Thomas de Stanes, parson of the church of Upminster, and John le Rous of Howes, to whom William de Burton and Eleanor his wife, probably the mother of William de Morwode, had previously conveyed the manor. In 1379 William de Morwode and Lora his wife were dealing with lands here, and in 1383 Nicholas de Morwode of Stoke Dry was killed by Richard, son of Richard, son of Robert of Stoke Dry. William de Morwode, who had settled the manor on his wife Lora, died seised of it in 1386, leaving a son and heir William aged 18. In 1391 Richard Salyng and Lora his wife, evidently the widow of the elder William de Morwode, levied a fine of the manor with John, Edmund, and Robert Morwode and others. William Morwode of Stoke Dry appeared in a plea of debt in May 1398, though in 1395 John Wakefield of London held the manor, possibly as mortgagee. In 1419 it was held by Roger Flore of Oakham, several times Speaker of the House of Commons, and John Clarke of Whissendine, both of whom were executors of the will of William Dalby, founder of the hospital of St. John and St. Anne at Oakham. Roger died in 1428, when John Clarke had sole possession. His son Francis married Agnes, daughter of Roger Flore. Francis died in 1435 in his father’s lifetime, leaving a son Francis who died in the following year, and a daughter Agnes who became his sole heir and married Simon, alias Everard DIGBY of Tilton; thus the Digbys came to Stoke Dry, which they made their chief seat. Everard was killed at the battle of Towton in 1461 and was succeeded by his son Everard, who married Jacquetta ELLIS (d. 1496). They had a son Everard, who succeeded to the property on his father’s death in 1509. He married Margery, daughter of Sir John Heyton, kt., of Norfolk, and died in 1540, when his son Kenelm succeeded. Kenelm was dealing with the manor in 1553 and conveyed it in 1574 to his son Everard, charged with payments after his own death to Katherine, Elizabeth, Ursula and Bridget his daughters. He settled the manor in 1588. He died in 1590. His wife Anne, daughter of Sir Anthony Cope, was still living at Stoke Dry at the death of their son Everard in 1592, who had settled on his wife Mary, daughter of Francis Neale of Keythorpe (co. Leic. ), his manor of Tilton in that county. Mary, too, survived Everard, who left a son and heir Everard, then in his fourteenth year. The younger Everard’s wardship was bought by Roger Manners, lessee of the manor and of Holy Oaks, who transferred it to Mary, Everard’s widow. Everard [the Gunpowder Plot Conspirator], who was knighted in 1603, married Mary, daughter of William Mulsho of Gayhurst or Gothurst (co. Bucks), and was a prominent person at the court of James I, where he came under the influence of the Jesuit Gerrard. He settled the manor on his son Kenelm in 1604. Being attainted and hanged for high treason for his share in the Gunpowder Plot in 1606, his lands were taken into the king’s hand. Sir Everard’s wife survived him for a widowhood of nearly fifty years, and Holy Oaks in Stoke Dry, demised by her in 1645, was still under sequestration for her recusancy in 1653, by which date she was dead. The manor passed under the above entail to Sir Everard’s son and heir Kenelm, aged two at his father’s death. He was dealing with it in 1624, but his mother’s Gayhurst property, where he was born, became his principal seat. He was knighted in 1623, married a wife of extraordinary beauty, Venetia, daughter of Sir Edward Stanley of Shropshire, and was made Gentleman of the Bedchamber, Commissioner of the Navy, and Governor of Trinity House by Charles I. In 1628 he defeated the Venetians with a squadron equipped at his own expense. His philosophical and scientific work brought him fame on the Continent and at home, and even, later, the friendship of Oliver Cromwell, though he was imprisoned and banished and his estates sequestered for his Royalist activities. In 1639 he mortgaged the manors of Stoke Dry and Tilton to Daniel Harvey, Elias (or Eliab), Michael, and Matthew Harvey. The transaction was allowed by the sequestrators in 1645, but after his banishment in 1649 it was the subject of petitions from 1650–1653 by claimants on his estate. These petitioners included his mother, his father’s brother George Digby of Standon (co. Staffs), Eliab Harvey, who was guardian of the late mortgagee’s son Daniel, and his own son John Digby, who became his heir after the death of his eldest son Kenelm in 1649. In 1655, with Daniel Harvey and his wife Elizabeth and Elias Harvey and his wife Mary, he conveyed the manor to John Morris for purposes of settlement. Kenelm Digby died in 1665. His son John, who was buried at Gayhurst in 1673, left two daughters as co-heirs, Mary (or Margaret Maria), who married Sir John Conway, second and last bart. of Bodryddan (co. Flint), and Charlotte, who married the Conways’ kinsman, Richard Mostyn. Mary died in 1690, Charlotte in 1693–4. In 1704 Sir John Conway and Richard Mostyn obtained an Act of Parliament for the sale of the Digby estates. 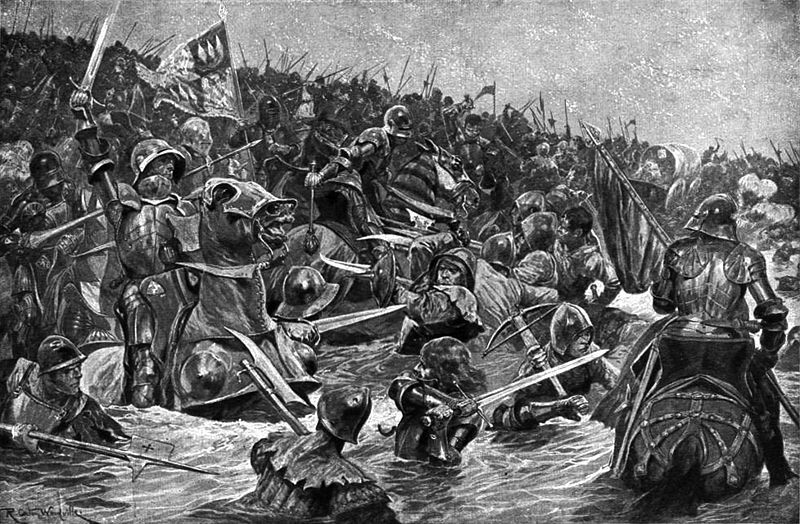 The Battle of Towton was fought during the English Wars of the Roses on 29 March 1461, near the village of the same name in Yorkshire. It was the “largest and bloodiest battle ever fought on English soil”. According to chroniclers, more than 50,000 soldiers from the Houses of York and Lancaster fought for hours amidst a snowstorm on that day, which was a Palm Sunday. A newsletter circulated a week after the battle reported that 28,000 died on the battlefield. The engagement brought about a monarchical change in England—Edward IV displaced Henry VI as King of England, driving the head of the Lancastrians and his key supporters out of the country. Henry was weak in character and mentally unsound. His ineffectual rule had encouraged the nobles’ schemes to establish control over him, and the situation deteriorated into a civil war between the supporters of his house and those of Richard Plantagenet, 3rd Duke of York. After the Yorkists captured Henry in 1460, the English parliament passed an Act of Accord to let York and his line succeed Henry as king. Henry’s consort, Margaret of Anjou, refused to accept the dispossession of her son’s right to the throne and, along with fellow Lancastrian malcontents, raised an army. Richard of York was killed at the Battle of Wakefield and his titles, including the claim to the throne, passed to his eldest son Edward. Nobles, who were previously hesitant to support Richard’s claim to the throne, regarded the Lancastrians to have reneged on the Act—a legal agreement—and Edward found enough backing to denounce Henry and declare himself king. The Battle of Towton was to affirm the victor’s right to rule over England through force of arms. On reaching the battlefield, the Yorkists found themselves heavily outnumbered. Part of their force under John de Mowbray, 3rd Duke of Norfolk, had yet to arrive. The Yorkist leader Lord Fauconberg turned the tables by ordering his archers to take advantage of the strong wind to outrange their enemies. The one-sided missile exchange—Lancastrian arrows fell short of the Yorkist ranks—provoked the Lancastrians into abandoning their defensive positions. The ensuing hand-to-hand combat lasted hours, exhausting the combatants. The arrival of Norfolk’s men reinvigorated the Yorkists and, encouraged by Edward, they routed their foes. Many Lancastrians were killed while fleeing; some trampled each other and others drowned in the rivers. Several who were taken as prisoners were executed. The power of the House of Lancaster was severely reduced after this battle. Henry fled the country, and many of his most powerful followers were dead or in exile after the engagement, letting Edward rule England uninterrupted for nine years, before a brief restoration of Henry to the throne. Later generations remembered the battle as depicted in William Shakespeare‘s dramatic adaptation of Henry’s life—Henry VI, Part 3, Act 2, Scene 5. In 1929, the Towton Cross was erected on the battlefield to commemorate the event. Various archaeological remains and mass graves related to the battle were found in the area centuries after the engagement. Margaret’s husband Sir William Skeffington (c. 1465-1535), lord deputy of Ireland, belonged to a Leicestershire family and was sheriff of Leicestershire and Warwickshire under Henry VII. He was master of the ordnance and a a knight of the shire (Member of Parliament) for Leicestershire from 1529–1535 in the reign of Henry VIII., and in 1529 was appointed deputy in Ireland for Henry’s son, the duke of Richmond, the nominal lord lieutenant of that country. Sir William was born in Skeffington, Leicestershire. His brother John was the patriarch of the Massareene family. He was appointed High Sheriff of Leicestershire and Warwickshire for 1508, 1515 and 1521 in the reign of Henry VII and was knighted by that king for his services. In 1523, he received from Henry VIII property near Tunbridge that had belonged to the executed traitor Henry Stafford, 2nd Duke of Buckingham. He was appointed in 1529 deputy in Ireland to Henry’s son, the duke of Richmond, the nominal lord lieutenant of that country. He crossed over in August 1529, but his power was so circumscribed by instructions from Henry that the head of the Fitzgeralds, Gerald, 9th earl of Kildare,, and not Skeffington, was the real governor of Ireland. This state of affairs lasted for three years and then in 1532 the deputy was recalled. In 1534, Kildare being in prison in England and his son Thomas, afterwards the 10th earl, being in revolt, Skeffington was again appointed deputy , at approximately 70 years of age. After some delay he landed at Dublin in October 1534 and marched at once to relieve Drogheda, but further progress in the work of crushing the rebellion was seriously delayed by his illness. However, in the spring of 1535 he was again in the field. He took Maynooth Castle, killing and executing the entire garrison. The heavy artillery used by him on this occasion earning for him his surname of “The Gunner”; he forced some of Kildare’s allies to make peace and captured Dungarvan. William died in Dublin on the 31st of December 1535, and was buried in St. Patrick’s Cathedral. He was succeeded by his eldest son Thomas. He was last Roman Catholic to hold the office either of Lord Deputy or Lord Lieutenant, with the exception of the Duke of Tyrconnel in 1687-1689 and Lord Fitzalan in 1921-1922. He first married Anne’s great aunt Margaret, daughter of Everard “Greenleaf” DIGBY William Skeffington was so fond of Digbys, that when she died, he married her great niece Anna, the daughter of Everard’s grandson John Digby of Kettleby. William and Margaret had four sons, including Sir Leonard Skeffington, who would hold the post of Lieutenant of the Tower of London. Sir Leonard is credited with having invented the “Scavenger’s Daughter“, which was a torture device used in the Tower during Henry VIII’s reign Following Margaret’s death, William Skeffington married secondly, Anne Digby, a daughter of Sir John DIGBY of Kettleby and his wife, Katherine Giffin. This marriage produced two further sons and three daughters. This entry was posted in Artistic Representation, Line - Miner, Storied, Violent Death and tagged 19th Generation, Battle of Towton, Shakespearean Ancestor. Bookmark the permalink. Hello Mark Miner, this Jeany Minor. I want to know if we have relations to the Founder of MINOR FOUNDATION OF MAJOR CHALLENGES OF NORWAY, PETER OPSVIK…..please? Because I am a member of ALPHA PHI OMEGA International Service Fraternity and Sorority Organisation of the Philippines. I am the one who asked my group to secure accreditations from Internetional Non-Profit-Non-Stock Organisations agencies of UN and we are now in the final stage of completing the UN’s requirements. We are looking for international partners who could help us or support us in any manners including financial assistance when accidentally one of the member in my group happened to came accross this Minor Foundation of Norway and asked me if we are related as relatives or cousin to the “Minor Foundation” founder Peter Opsvik. Thank you very much.